When you ride your bike, do you check the gear display on your shifters? 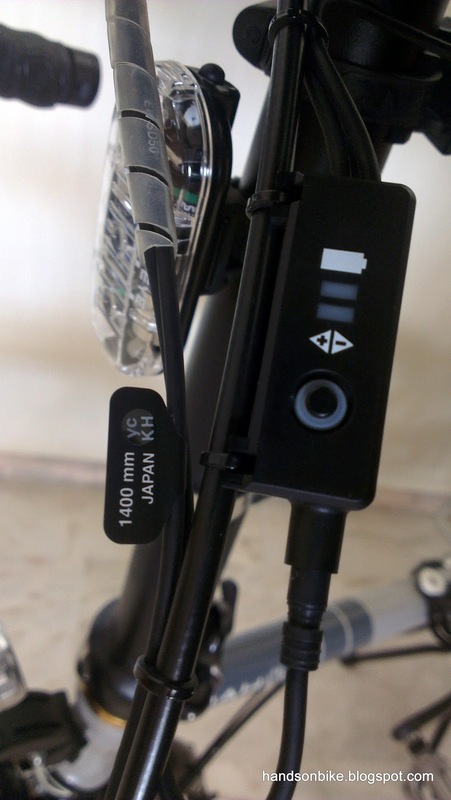 For road bikes, the higher end Shimano models (105, Ultegra, Dura-Ace) do not have gear displays, whereas the mid range components (Tiagra, Sora, Claris) have a gear display to let you know which gear you are in. The reason for the lack of gear displays on higher end models is because of weight savings, and also because riders who use high end components are presumed to be more professional, and thus do not need a gear display to tell them which gear they are in. They just shift the gears according to how it feels while riding. Same for mountain bike shifters. High end mountain bike shifters such as SLX, XT and XTR have no optical gear displays (or have removable versions), as the riders are unable to check the gear display anyway when they are bouncing along the trail and tackling tough off-road conditions. 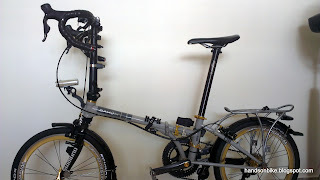 It has been almost 3 months since I upgraded the components on my Dahon Boardwalk to the Ultegra Di2 system. During this time, I have had plenty of chances to test out the system and get used to the new system. However, the system is not complete yet. Although it is fully functional, there is actually one more component (optional) in the Di2 system that has not been installed yet. 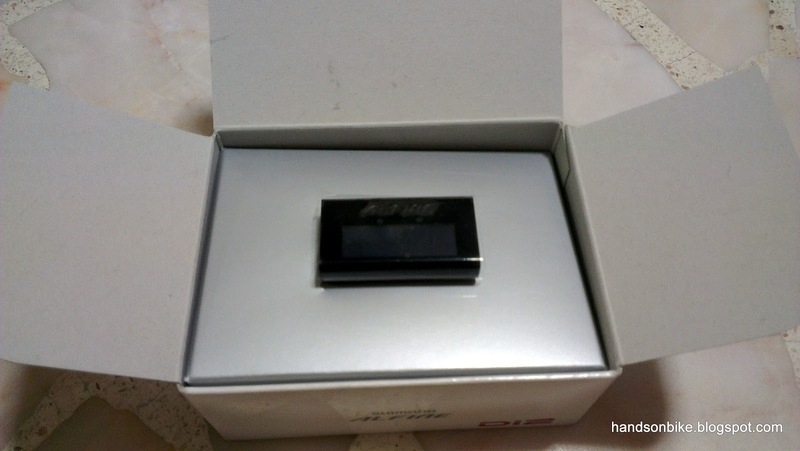 This component is the digital display of the Alfine Di2 system. Strictly speaking, this digital display is not part of the Ultegra Di2 system. The original Ultegra Di2 system is a road system with no gear display. 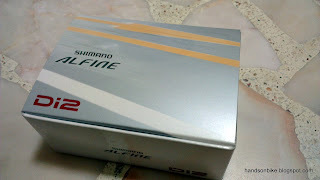 Besides the Ultegra/Dura-Ace Di2 system, there is also the Alfine Di2 system. 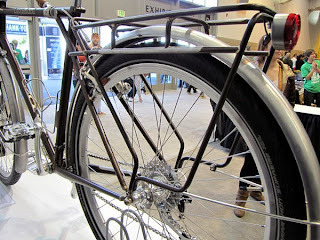 Alfine Di2 is designed more for touring or urban bikes, with a rear internal hub. With Alfine Di2, shifting the internal hub is now even easier, as it is an electronic gear shifting system. This digital display comes with the Alfine Di2 system, providing a clear gear display for the rider. 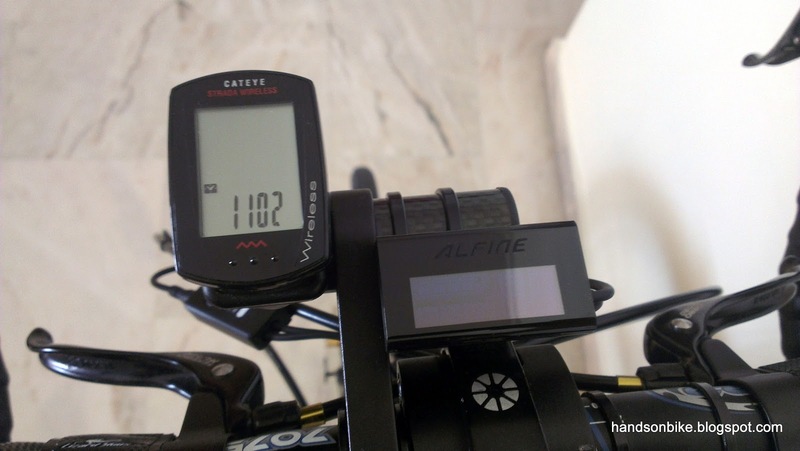 Through experimentation by other users, it is found that the Alfine Di2 digital display can actually be used on the Ultegra Di2 display. This is probably because of similar system architecture between the two Di2 systems. Alfine Di2 Digital Display. Individual packaging. Only the display inside! Model number is SC-S705. 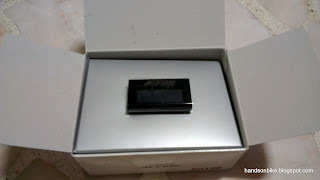 Small display size, with the Alfine name on top of the LCD screen. 2 ports on the display. 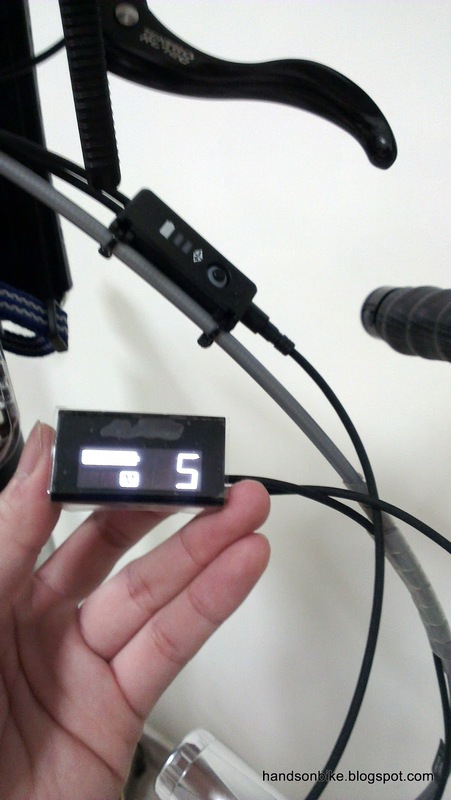 This display is connected in series on the Ultegra Di2 system. As such, one of it is the IN port, the other is the OUT port. Either port can be used as the IN port. 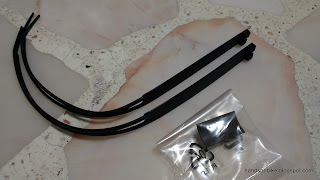 The special cable ties and rubber shim that comes with the display. 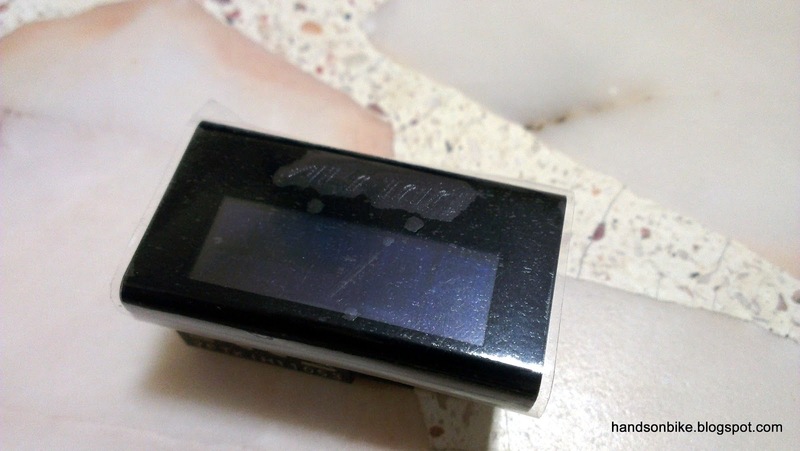 Used to mount the digital display onto the handlebar. One problem I faced when connecting up the display is that I need an additional wire! 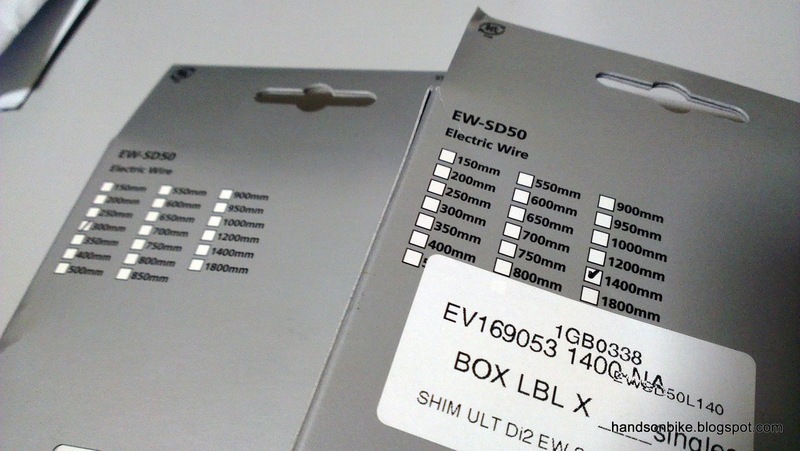 As this display will go between two components, one additional wire is needed to connect up the system. I had to borrow an extra wire to try out the system. Also, it was not clear where the display should be installed in the system. There is no manual as this display is not officially part of the Ultegra Di2 system. Initially I thought it should be installed between the right shifter and Junction A. However, when I connected it up that way, the shifting still works but nothing is displayed on the screen. Subsequently I connected it between Junction A and Junction B, only then did it work and display the gear number! Yes it works! The screen came alive! 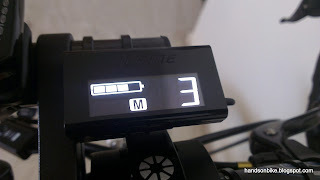 So, the Alfine Di2 digital display needs to be connected between Junction A and B. The good news is that I don't need to remove my bar tape to re-route the wires. The bad news is that not only did I need an extra wire (which should have come with the display), I need a new longer wire between Junction A and B! The current wire length between Junction A and Junction B is already a pretty long 1200mm. However, since the wire (between Junction A and B) now needs to go into the display before the display connects to Junction A, I need a longer (1400mm) wire! 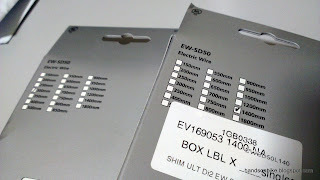 An additional wire of 300mm is also required to connect from the display to Junction A. Thus I had to wait while I ordered the 2 new wires (300mm and 1400mm) from Evans Cycles. Finally, after about 10 days, the new wires have arrived! With these new wires of proper and suitable length, I could finally wire up the Di2 system properly. At the same time I also changed the outer casing for the rear brake from grey colour to black, to better camouflage the Di2 wires. Before: Testing the Alfine Di2 display with inappropriate wire lengths, messy! After: With the new wire lengths, the wiring is now neater than before. 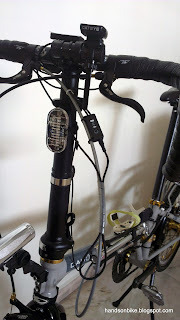 The wire from Junction B first goes up to the digital display located on the handlebar extension mount, before another wire connects from the display down to Junction A. The digital display is fixed to the extension mount by the use of cable ties. I did not use the special cable ties that came with the display as I found that normal cable ties are good enough. 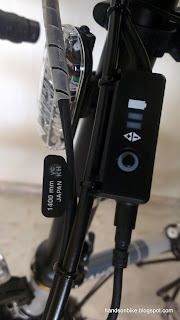 Alfine Di2 display right in the middle of the handlebar, above the handlebar clamp. Wires running around Junction A. So, what is so good about this display? The main attraction for me is that it looks really good! As you will see in the pictures below, the gear display is really bright and sharp, and gives a really nice high tech feel to the bike. In fact, it looks much better when you see the real thing as compared to seeing it in the picture. 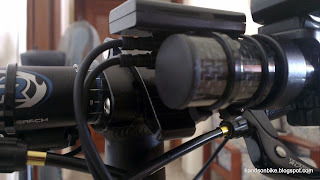 It is also very useful at night, where all other gear displays cannot be seen properly as they are not lighted. Besides showing the gear number, it also has a battery indicator. Probably not so important, as you can already use Junction A to check the battery life. But a nice touch of convenience nonetheless. For the racers who don't need a gear display, this would not be a useful accessory. But for myself, I still frequently check the gear that I am currently pedaling in. Before I got the display, I would try to identify the gear by looking downwards and back at the cassette, but this is tricky and difficult. 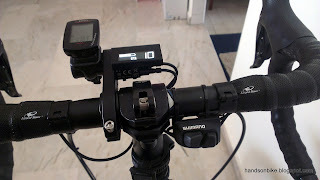 With such a prominent gear display right in the middle of the handlebar, checking the selected gear is now super easy! Displays the current selected gear on the cassette. I love the secondary cockpit on my Boardwalk handlebar! With additional secondary brake levers and satellite shifters, I get both a road bike and a flat handlebar setup on the same bike. Clean cable and wire management on my Dahon Boardwalk. 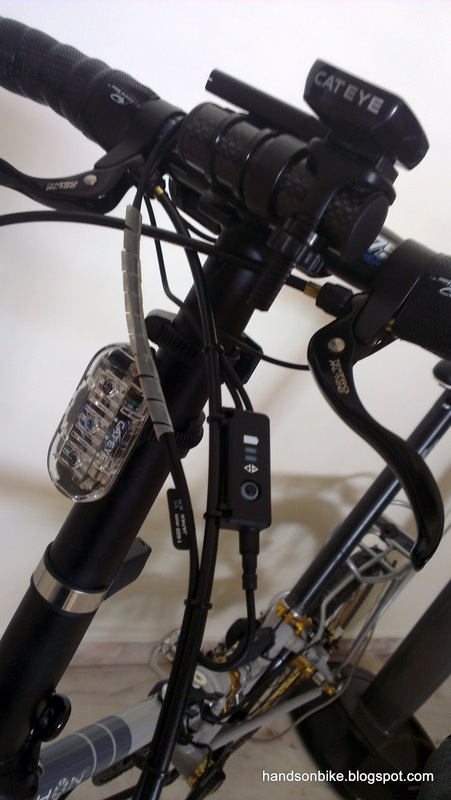 With only one cable+wire running to the rear of the bike, it eliminates messy cabling! 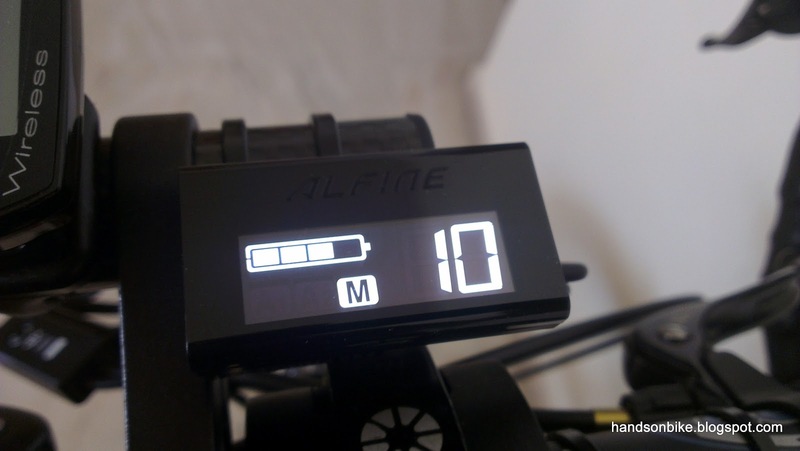 Of course, there are also downsides to having the Alfine Di2 digital gear display. For one, the battery life will be shorter, since the display also consumes some power. Not sure how much it will affect the battery life, it can only be found by experimentation. In any case, the digital display only turns on when you shift gears, and it will turn off after a few minutes of inactivity. I'm loving the new Alfine Di2 Digital Gear Display on my Dahon Boardwalk! Did this need the firmware upgrade to work? ps I will probably find out next week anyways as I have the display turning up! Not sure if the firmware upgrade is required, as I already upgraded the firmware before I installed the display. Just give it a try first since you will be getting the display anyway. Steve just saw the blog about the display. I'm trying to connect a display to a 6880 disc group, sofar without any luck. Could you help me out? 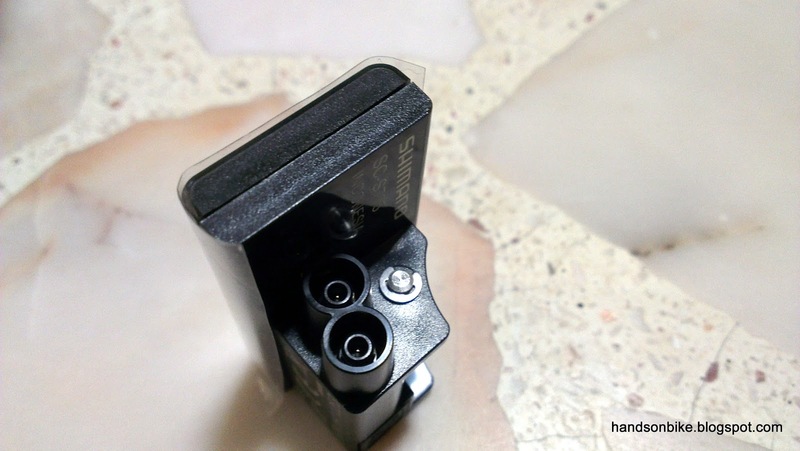 I think it will not work with the newer Ultegra 6870 Di2 components. Good to hear that it is working! Glad I was able to help. Hi Steve...I'm running an ultegra di2 and just purchased the display. Do you know if I'm going to need a longer wire between junction a and b along with another wire for a display to junction a? FYI I'm riding a size 54 road bike. Thx. First, I'm assuming that you are using Ultegra 6770, and the display is mounted near the handlebar. Most likely you need a longer wire from junction b to the display, since the display is mounted further away from junction b compared to junction a. Then, you will also need a short wire from junction a to the display. Ok. Ordered the 300mm for the wire to junction a. What size do I need now? 1400mm? Thx. I am having trouble with the Alfine display coming to life in a similar setup. 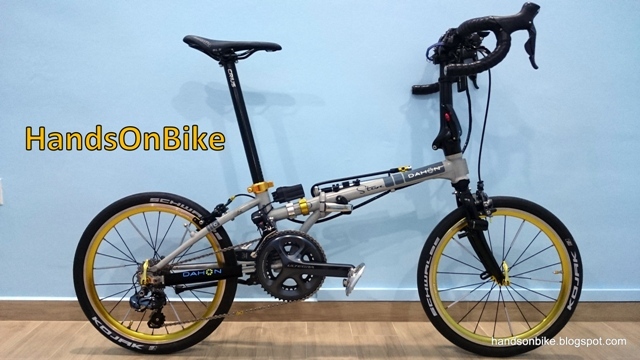 Using on a recumbent trike- I have the EW-90 front junction, 6770 front and rear derailleurs and the SW-R671 shifters. 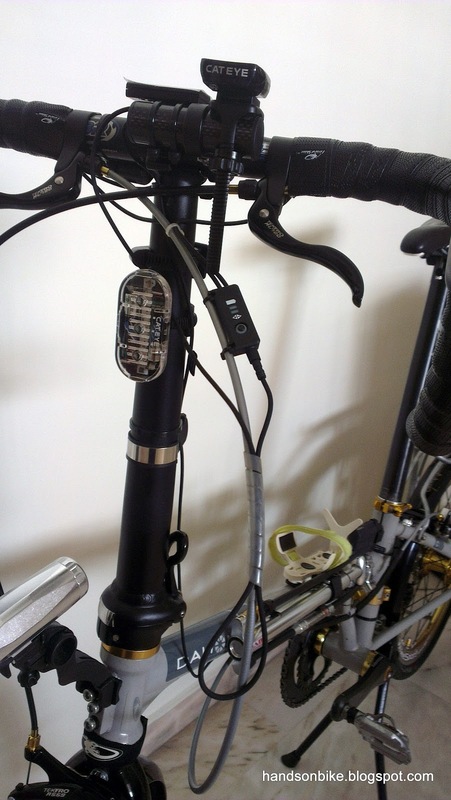 The Alfine display installed between the EW-90 junction and the RD-6770 derailleur. No go. I got it to work on another road bike in the same position but using 6870 components. Any ideas? 1) Does the shifting work despite the display not working? 2) The firmware on the 6770 series components might need to be updated. 3) The display should be between junction A and junction b.